First it was ghosting, then it was tide pods, and now the youths are apparently sleep texting. A new study out of Villanova University published in the Journal of American College Health has coined a nighttime behavior it calls “sleep texting.” Scarier still: although the survey only studied college students, sleep texting can happen to anyone. The study claimed that the beep or buzz of a cell phone is so common that even in sleep, we instinctively reach over to our phones. 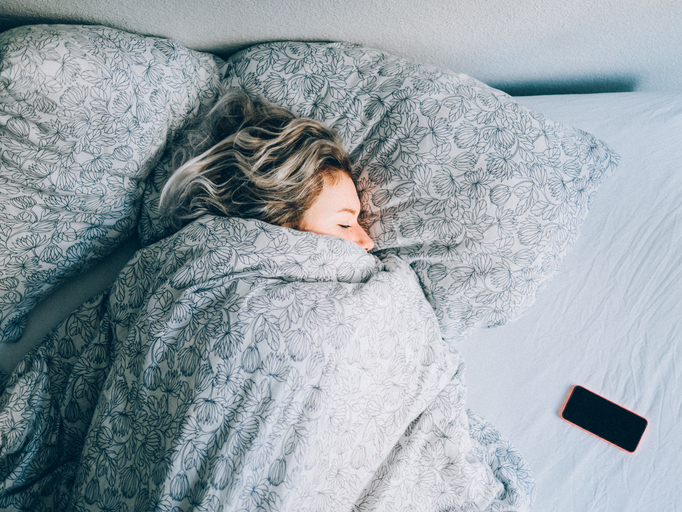 According to researches, sleep texting is defined as “when an individual responds to or sends a text message electronically while in a sleep state,” and nearly 100 students polled admitted to sending sleep texts. While the study aimed to look at how sleep quality is affected by this zombie texting state, most people are more worried that they might be sending gibberish to their exes in the middle of the night. I have to get the mego"
The study concluded that this act isn’t dangerous, only embarrassing, however, even if you don’t do any sleep texting, sleeping with your phone in your bed with the ringer on isn’t a great practice if you want a good night’s rest. "If possible, recharge your cell phone out of the bedroom so you can recharge in bed!" Nancy H. Rothstein, an adjunct lecturer at NYU Rothstein, told HelloGiggles. "Or at least, put your phone across the room so you don’t look at it in bed. Purchase an old-fashioned alarm clock with hands and no bright lights, rather than using your cell phone, because you will be tempted to look at texts and emails." Poor sleep, weird 2 a.m. texts? We’re officially locking our cell phone in the living room at night.